Before the healthcare reform bill reaches President Obama's desk, here are the issues that are still worth fighting on to ensure reform helps as many Americans as possible. Health reform appeared on the verge of death many times over the past few weeks, but early Christmas Eve morning the Senate passed the Patient Protection and Affordable Care Act on a party-line vote after major concessions were made to secure the votes of conservative Democrats. The Party’s fragile unity was amusingly underscored during the role call vote when Majority Leader Harry Reid, in a confused moment, voted “no” before quickly correcting himself. Though this is the first time in generations of trying to overhaul our healthcare system that both chambers of Congress have passed a reform package, many progressives do not consider today’s vote a victory. The public plan died–at Joe Lieberman’s hand, no less–and the bill contains restrictions on abortion coverage that threaten women’s access to reproductive health services. Despite these very serious shortcomings, however, the bill the Senate passed would reduce the number of uninsured Americans by 31 million by 2019. The Medicaid program will be open to new ranks of the country’s poorest residents, and the near-poor and middle class will get subsidies to buy insurance. The Senate also advanced some important delivery system reforms that could chart a path towards reining in costs. As disappointed as progressives are with the compromises Democratic leaders made to get this bill through the Senate–and as tempting it is to believe they may have gotten a better deal if they’d pursued a more aggressive strategy–they are on the verge of doing many other lawmakers have tried and failed to do. And if this effort fails, another generation may pass before another chance will come to try again. 1) Affordability: The House generally does a much better job helping low- and moderate-income Americans afford coverage. For the very poor, it opens the Medicaid program individuals to who earn less than $16,245 per year, whereas the Senate only makes the program available to those earning less than $14,404. The Senate offers more subsidies to help the middle class buy coverage than the House, but the Senate’s subsidized insurance offers weaker coverage than that mandated by the House and leaves these Americans far more exposed to out-of-pocket costs. 2) Enforceability: The Senate would have insurers sell policies in state-based exchanges, relying on state officials to police the market. The House, on the other hand, sets up a national exchange, and many believe the federal government can do a much better job protecting consumers than state regulators. There are also questions about whether the Senate’s legislative language protects consumers’ right to go to court if insurance companies violate the new regulations. The House says that insurance companies can only charge an older person twice as much as a younger person. While that may still be a wide variation that could hurt older consumers, it is better than the Senate’s language, which allows insurers to charge three times as much. 3) Financing: The House is funded primarily through a progressive income tax on families earning more than $1 million, and it also requires employers to either cover their employees or pay into the system. 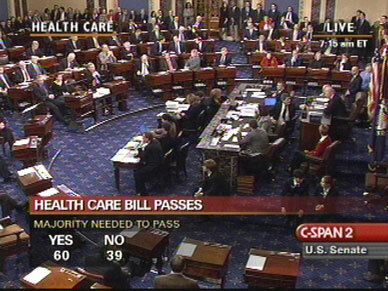 The Senate, on the other hand, relies on a tax on “high cost” health plans. The hope is that this will slow healthcare inflation. But the tax is poorly designed and implemented in the absence of other, more aggressive cost-control measures, which means there’s a good chance this could wind up hitting people who are not receiving lavish benefits. The Senate also ditches an employer mandate in favor of an awkward fine on employers if they have any employees who take federal subsidies to buy care on their own. This might create a perverse incentive against hiring low-income people. The House version is expected to cover 5 million more Americans than the Senate’s, largely through its expansion of the Medicaid program. The delicate politics means things like the public option are probably off the table. But there are other, more achievable goals that are worth fighting for in the weeks ahead.